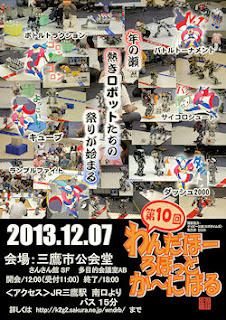 The 10th Wandahoo Robot Carnival will be held at Mitaka City Public Hall in Mitaka City, Tokyo on Dec. 7th, 2013. The 10th Wandahoo Robot Carnival took place on Dec. 7th, 2013. Sanzai-san reported the details in his blog (in Japasense). `Ustream Wandahoo Robot Carnival` is also keeping all videos. The competition will be shown on `Ustream Wandahoo Robot Carnival` from 12:00 to 18:00 , Dec 7th 2013. (JST). Wandahoo Robot Carnival is sponsored by Ishikawa-san and supported by the members of Kanto ROBOT Practice（Kanto-gumi　Robot Training Meeting）. Ishikawa-san and his stuffs are busy preparing USTREAM Live system of the Carnival now. 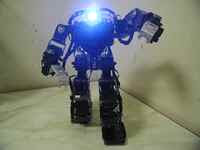 Entry of the Carnival will finish on Nov. 30th, and 30 robots will join. The Carnival is robot competition consisted with various four type games such as Dash 2000 (competition of 2 robots, 2 m U-turn course foot race; each robot gets points depended on the order of record time), Bottle Traction (pushing or pulling a basket with 500 or 1000 ml bottles for 2 m within 1 minute; points are multiplication of number of bottles and distance carried), Dice Shot (dice soccer of 2 robots; each robot gets points depended on the spots of dice shot for 2 minutes) and Cubs (team game of 3 robots each, carrying cubs to own territory for 2 minutes; winner team members get points) and Robot Fight with the best 4 robots. Therefore, this Carnival is called `Robot Olympic`. Each robot gets points from each game. In the case of team game, winner team member robots gets points. Four robots gotten many points can join the final tournament of Robot Fight. The rest robots have Ramble Fights. Those games were planned by Ishikawa-san. 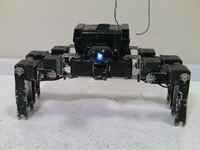 It is necessary for winner that the robot has a high activity with performance and also good luck. The 1st Carnival took place on July 16, 2006 and then the Carnival held twice in January and July every year. From 2010, the Carnival takes place in July once a year. Animader-san painted each event poster. As for the poster gallery, click here. The theme song of Carnival also can be downloaded here.